The U.S. Federal Reserve is slowly raising the cost of borrowing after seven years of exceptionally loose monetary policy. But by taking so long, there’s a danger the central bank under Chair Janet Yellen may need to cut rates again relatively soon. While a swift retreat might be insignificant on paper, the Fed’s credibility would suffer. GDP will grow by 2.3 percent in 2016, according to Goldman Sachs, after expanding 2.5 percent in 2015. The unemployment rate, now at 5 percent, could dip lower, and the rate of inflation is below 2 percent. This all fits the Fed’s mandates covering full employment and stable prices, though Yellen et al would prefer stronger price increases. The data-driven picture is not, however, especially robust. It’s easy to imagine scenarios which throw a few assumptions about future growth off course. One possibility is that as U.S. monetary policy diverges from the European Union and Japan, it lifts the dollar further and slams exports. Then, capital flight from emerging markets to safer dollar-denominated assets provokes a crisis, or even defaults, roiling global markets. Another risk is that the post-2008 recovery cycle and the accompanying market buoyancy turn sharply. Rumbles in the high-yield bond market, including the closure of a Third Avenue Management mutual fund could, in the worst case, be early signs of exactly that. U.S. and global sentiment, tourism and trade could suffer, too, should Islamic State jihadists carry out further attacks, following murderous sprees in Paris and California and the downing of a Russian passenger airplane over Egypt. Some of these possibilities are baked into forecasts. Goldman says a euro may buy only $0.85 by the end of 2016, for instance, from about $1.10 recently. And JPMorgan estimates the probability of a recession next year at below 25 percent. But a combination of unexpected events could alter the forecasts. The Fed could find itself needing to inject stimulus. Yellen wouldn’t have much ammunition if rates have only by then made it up to 1 percent, say. More worryingly, it would look bad for the Fed to reverse course so soon after taking years to get to the point of liftoff. Politicians, including Republican presidential contenders, are already campaigning to curtail the Fed’s powers and audit its inner workings. Any appearance of flip-flopping would boost their case. 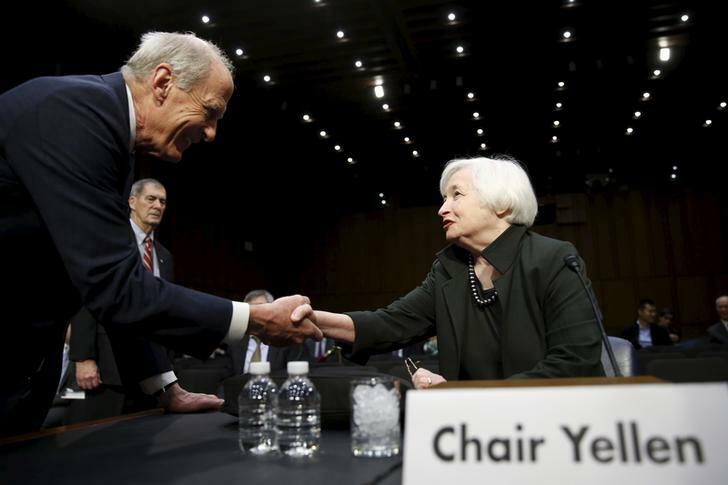 United States Federal Reserve Chair Janet Yellen (R) is welcomed by the chair of Joint Congressional Economic hearing, Senator Daniel Coats (R-IN) (L) on "The Economic Outlook" in Washington December 3, 2015. The U.S. Federal Open Market Committee on Dec. 16 raised the target for the fed funds rate to 0.25 to 0.5 percent from the current zero to 0.25 percent range. Near-zero rate policy has been in place since December 2008. The last time the Fed increased interest rates was in June 2006.